Notice: Undefined index: und in _dwell_imagefield_get_image_data() (line 226 of /var/www/html/dwell/drupal/sites/all/modules/custom/dwell_imagefield/dwell_imagefield.module). Notice: Undefined variable: image in include() (line 10 of /var/www/html/dwell/drupal/sites/all/modules/custom/dwell_imagefield/imagefield-rendered.tpl.php). Our Color Stories have been so popular on Dwell.com, we've decided to share more inventive color inspiration. Here, we feature a selection of spaces showcasing bold washes of bright color on floors, walls, cabinets, and more (including a major case of matchy-matchy that works). 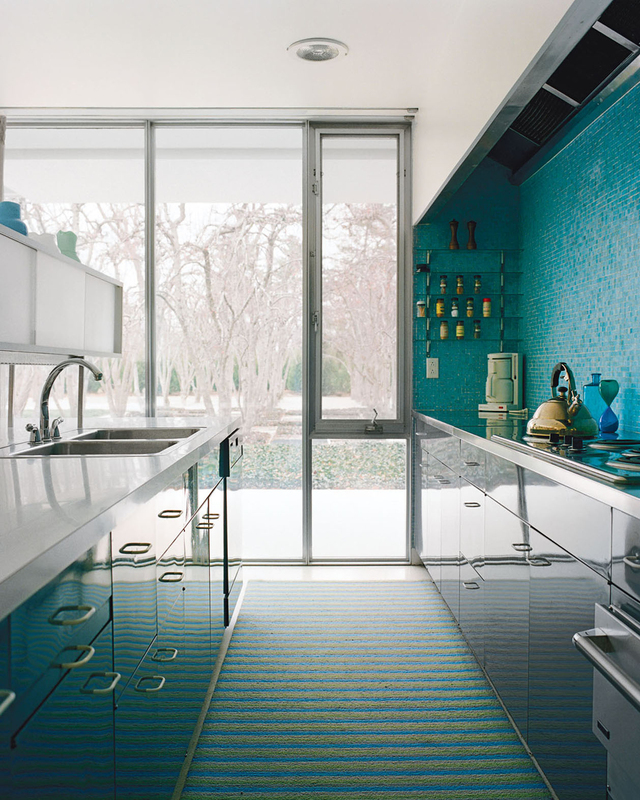 Only opened to the public last year, the iconic Miller House features a brilliant monochromatic kitchen with teal mosaic tilework and glossy cabinetry. The warmth of wood in the Dolce and Burnham Residence balances the intensity of bold red cabinetry; it's a good example of how even heavy doses of strong color don't have to overwhelm a space. "In order to get the color brightness and hues seen on the stucco walls we used a custom mixed process listed below:1. The design team selected the following colors: Benjamin Moore Pink Punch 2006-50, Benjamin Moore America Cheese 2019-40.2. We acquired a lacquer concrete stain that custom-matched the colors.3. We added a yellow and pink color pigment to the stucco mix before applying both the base and finish coats on walls. (From Davis Colors)4. Before the 'finish stucco coat' had completely dried we applied the custom matched lacquer stain. Well-matched: Bedding and a sliding panel wall treatment in the bedroom of the home featured in Harlem Renaissance. The Scandic hotel: More, in the case of color at least, really is more. The glossy Safety Red paint by Benjamin Moore catches the light by day but “becomes a richer, darker, very relaxing red at night,” says one of the residents of this East Village, New York home. A neutral palette in this budget-friendly vacation home in Mexico is punched up by a surprising application of high-octane orange. In the Dayton Residence, coral paint goes from backsplash to floor and beyond. The architect explains that the recessed wall with built-in storage shelving is a counterpoint to the view of Boston in the opposite direction.